I am back from hiatus. We've moved into our new house and are all settled. Plus I actually have some time away from my busy work schedule right now. To follow-up from my last post my white cake made with xanthan gum but without the bake-even strips worked well, althought I only used 1 tsp of xanthan gum and it didn't seem to hold it together as well - but it also wasn't gloopy. I also learned to mix the batter and add the xanthan gum at the last possible second, blend, and then pour into the pans to reduce the gloopiness. Technical word, I know. The vegetarian red velvet cake with 2 tsp of xanthan gum still came out crumbly but they were slightly overcooked so I think that's the cause. I hope to make another test cake soon. The german chocolate cake with coconut walnut cream frosting came out great, everybody loved it. I was on a tight schedule that weekend with two cakes just a week before we moved and the frosting wasn't setting up quickly enough, even in the fridge so I added some xanthan gum. Then some more, and more, and more. I was able to frost the cake while the frosting was still a bit too thin but it hardened up quickly. I know there was too much gum and it made it really thick and sticky so I'll have to try it again soon with enough time for it to cool naturally. Last week I made cupcakes for Evelyn's goodbye party at work and a cookie cake for my co-worker's daughter. They both turned out great. Cupcakes were the typical red velvet and buttercream, I have 20 cake recipes and all anyone wants is red velvet. I was tired of swirls so I tried something different. They look flowery & lacy and I really like it. The cookie cake was a new thing for me. 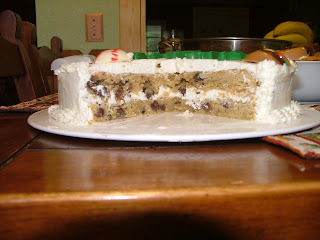 I could have made the typical 1 layer thin cookie cake but I had a better idea, an actual cookie-cake. Cookie instead of cake. So I made a cake layer sized cookie. I frosted the cookie cake with buttercream and decorated with summer-themed candies. The candies were fun and challenging to make. I did more planning with the order of the colors so it took much less time. Lots of toothpicks sacrificed themselves for these candies. I asked my friend to take a picture of the cut cake and she so kindly delivered.